Wondering what exactly is going on with those women at 0:22. And that is a very interesting place as far as weird things per square foot. @djslack I want to visit there. But taking a credit card would be a big mistake. So much cool stuff. @bramby2 @cinoclav There’s like not quite a spanking, but(t) there is something going on there which ceased quickly as the camera approached. That’s all I’m saying. @therealjrn I’m glad you like them. Honestly, the Pinewood Derby is the sole reason I enrolled my son in Cub Scouts. The first year he did the race, it sucked, so I overthrew the old regime and took over his Pack. My first order of business was to improve the Derby, which was a huge success. If only we could do the Derby every month. He took 2nd place in our District this year. I told him that 2nd place wasn’t good enough but he seemed happy with it anyway. First place or GTFO, because if you’re not first, you’re last. Love the band bit towards the end with all the drunkies and steins! Feckin’ geese. Always such jerks. @Cengland0 We put out water for the birds out front. We get lots of crows and pigeons. Nothing as exotic as geese. Way cool! @lisaviolet Here’s a still photo of them destroying the pool. That was my neighbor’s pool and I finally saw her today so I showed her the video. She said she knew something happened because she had to clean it up afterwards. These particular geese have been coming to my house since they were goslings. So cute. Now I have to deal with them pooping on my driveway every day and then hosing it off. 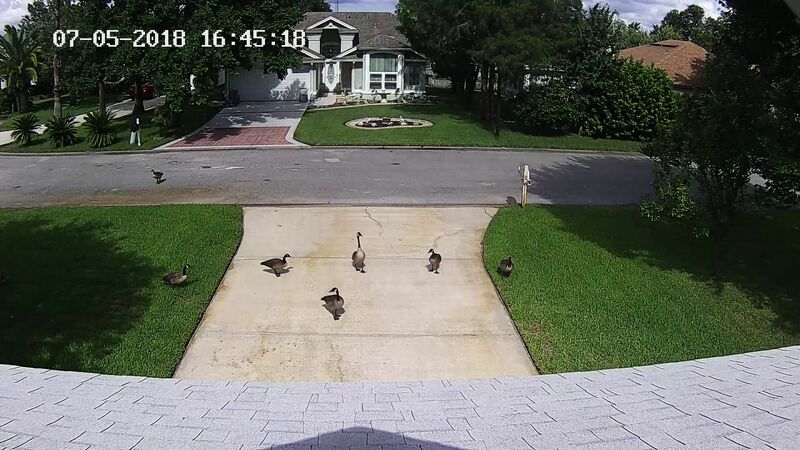 Here they are from one of my security cameras. All grown up. @lisaviolet I put out water for the birds too. I get squirrels. @sammydog01 I make comments on the Meh forum. I get squirrels, too. Could I send you some deer and turkeys? The turkeys are also jerks when they’re here. Nice, I liked this one. Looking forward to the next one @Dave cooks up. Love that Lego set @Dave.